Ghanaian Professor, Horace Campbell Advocates for Canal System to Save Africa and the Globe — UTech, Ja. 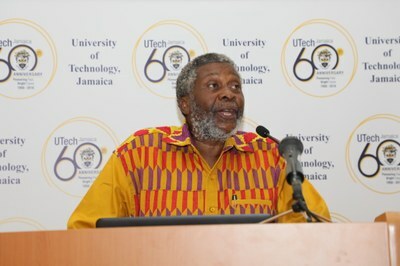 Professor Horace Campbell delivering the UTech, Jamaica Distinguished Lecture on Wednesday, April 4, 2018 at the Shared Facilities Building, Papine Campus. Jamaican-born, Ghanaian Professor Horace Campbell who holds the Kwame Nkrumah Chair at the Institute of African Studies, University of Ghana, Western Africa delivered the University of Technology, Jamaica Distinguished Public Lecture on the topic, “From the Engineer’s dream to the Pan African Reality: A Canal system for the reconstruction and regeneration of Africa” on Wednesday, April 4, 2018 at the University’s Papine Campus. Professor Campbell is a noted international peace and justice scholar and a distinguished voice in the struggles for freedom and justice of African people. He has been involved in Africa's Liberation Struggles and in the struggles for peace and justice globally for more than four decades. His lecture addressed the urgency of a canal system renewal for Africa within the context of Nigeria’s dying Lake Chad which has lost 95 per cent of its water over the past 60 years as a result of extended drought, the impacts of the climate crisis and lower levels of rainfall in the region. With the aid of photographs taken on his recent visits, and pictures from NASA, Professor Campbell painted a vivid picture of the catastrophic outcomes of the drying up of Lake Chad. The Lake has shrunk from over 25,000 square kilometres (sq. km.) to less than 2000 sq. km. He explained that this reality currently threatens the livelihood of 370 million citizens living in the countries of the Lake Chad Basin shared by Algeria, Cameroon, the Central African Republic, Chad, Libya, Nigeria, Niger and Sudan. The climate crisis has negatively impacted the livelihood of the over 13 million people living immediately around the lake, resulting in conditions of low levels of water, the shrinking of land for grazing cattle, the receding of fishing grounds, famine and raging forest fires. The Pan African unity scholar in his wide-ranging presentation noted that the work of the Kwame Nkrumah Chair in Ghana aims to go beyond the traditional narratives of conferences and great men and women to driving a movement of Pan African unity in relation to the lived experiences of Africans. “These experiences bring to the fore issues of food, clothing, shelter, decent education, access to health care and a clean environment,” Professor Campbell asserted. The plan to save Lake Chad has evolved over the past forty years. Prof. Campbell highlighted recent engineering water transfer solutions to replenish Lake Chad with a robust canal system, including those coming out of the international conference on Lake Chad held in Abuja, Nigeria in February 2018 which proposes to recharge the lake by transfer of water from the Congo to Lake Chad. The vision of the inter-basin water transfer from the Congo to Lake Chad has been the engineer’s dream for eight decades Professor Campbell noted. He asserted however, that to make the replenishing of Lake Chad transfer from an engineer’s dream to a Pan African reality will require international cooperation, but ultimately will need “the political will of the Global African Family.” He argued that Africans will have to take the lead in navigating social peace, political will, use of African resources and in mobilising the mass of the people on the meaning of global warming of Africa. Professor Campbell drew attention to his recent book Global NATO and the catastrophic failure in Libya which points to efforts that were being laid by Libyan Leader Muammur Gaddafi for a project to construct an underground water pipeline to utilize the aquifers to better the quality of life of Libyan peoples. This water transfer project called the Great Man Made River was envisaged to facilitate the re-greening of the advancing desert areas in Libya and provide enough water for mass consumption prior to the destructive NATO intervention in Libya. The greatest ground water storage in northern Africa is in the large sedimentary basins, in Libya, Algeria and Chad. Debunking the myth that Africa had no scientific history, Professor Campbell reminded the audience of the contribution of African engineers, pointing out that the specialized knowledge that came to be associated with engineering emerged from a knowledge system in Africa, including branches of engineering, first developed in Africa which gave rise to what is called hydraulic civilization. 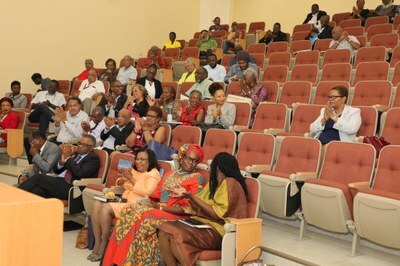 In attendance were members of the diplomatic corps, university educators and administrators from UTech, Jamaica, UWI, environmentalists, students and members of the local Nigerian community. 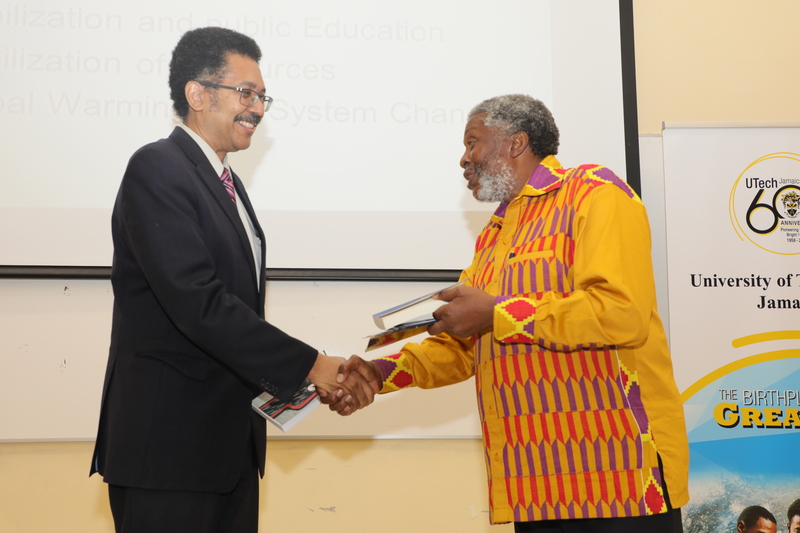 Professor Stephen Vasciannie (left) President, UTech, Jamaica accepts copies of publications authored by Professor Horace Campbell, Kwame Nkrumah Chair at the Institute of African Studies, University of Ghana, Western Africa after he delivered the University of Technology, Jamaica Distinguished Lecture on the topic, “From the Engineer’s dream to the Pan African Reality: A Canal system for the reconstruction and regeneration of Africa” on Wednesday, April 4, 2018 at the University’s Papine Campus. The book titles are Global NATO and the Catastrophic Failure in Libya, Rasta y Resistencia: de Marcus Garvey a Walter Rodney, Walter Rodney and Pan-Africanism Today and a copy of his inaugural lecture on the topic, “Reconstruction, Transformation and the Unification of the Peoples of Africa in the 21st Century: Rekindling the Pan African Spirit of Kwame Nkrumah.